If you have the HubSpot-Salesforce integration enabled, you can import Salesforce leads, contacts, accounts, opportunities, tasks, and campaigns into HubSpot. 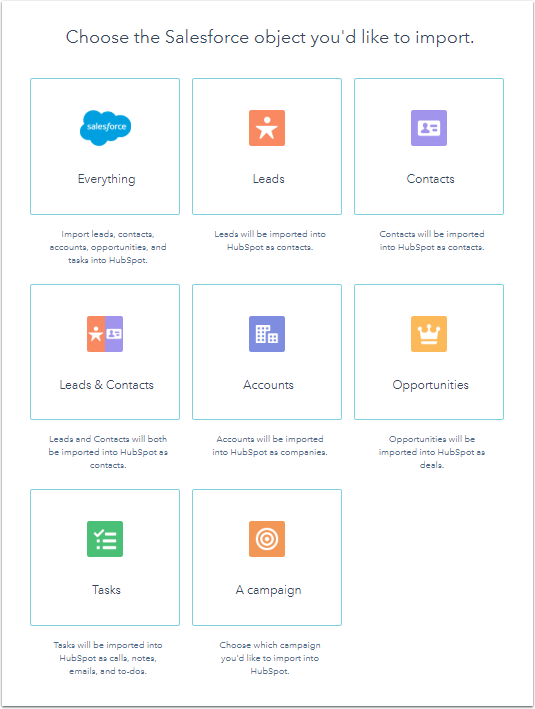 Select Salesforce records, then select the Salesforce object you want to import: Everything, Leads, Contacts, Leads & Contacts, Accounts, Opportunities, Tasks, A campaign. In the bottom right, click Review. If you select Everything, note that large imports may take several hours in order to make the best use of your Salesforce API calls. If you select Leads, Contacts, Leads & Contacts, Accounts, Opportunities, or Tasks, review the number of records that will be imported from Salesforce into HubSpot. If you select A campaign, click the Choose a campaign dropdown menu and select the Salesforce campaign to import into HubSpot, then click Review. You'll be redirected back to the Imports screen. When your import is complete, it will appear in the import table. Please note: if you are importing leads and/or contacts from Salesforce, only the lead/contact's email address will be synced over from Salesforce at the time of import. In accounts with no inclusion list, or for contacts in an inclusion list, a sync is automatically triggered after the import, which will sync over the remaining Salesforce field values. For contacts not in the inclusion list, all other contact properties will remain blank.